I have decided to do my first knit a long. I didn't know how I was going to do it, so I asked the Blog Hub Group what they thought about where and how I should host one. They very cleverly told me I should set up a group on Ravelry and host it there. So I have. My group is simply called Stitched Together Designs. While I was working on the idea of a group, I set a Flickr group up too, which can be found here. I am all alone in the Flickr group, but I thought I'd set it up anyway, if only so I could find all of my Stitched Together Designs project photos! You will be pleased to know there are several other members in the Ravelry group. It won't just be me knitting there all alone! The KAL is going to revolve around Lily's Slice of Pi Shawl. I decided that I wanted to do a KAL after going through the test process for this shawl and really enjoying the social aspect of chatting in a small group over a couple of months. I wanted to duplicate the experience, but this time I would join in the knitting with the group rather than worrying about stitch counts! I have decided that this is going to be a loose and informal KAL. I'm not going to offer any prizes or have any deadlines. I'm not a famous designer who is going to have sponsors lining up to offer prizes, and I can't afford to buy any myself. 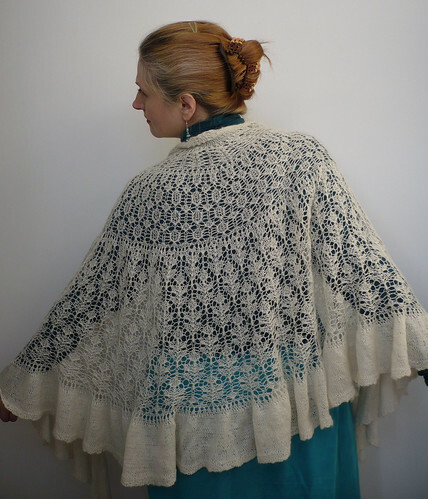 So without any other perks, I have decided to sweeten the pot a little by offering a discount on the shawl pattern for people who join the Lily's Slice of Pi Shawl KAL - Joining thread. If you join the linked thread I will message you a single use discount code which will be valid until midnight (GMT) on 5th March 2012. The 5th of March is the date that the KAL is "officially" starting, but to be honest I think lots of people will start before this date. In fact, I know that some people have already downloaded the pattern. For those people who have already bought the pattern at the full price of £3.75 and still want to join the KAL, I will send them a discount code to be used on any other Stitched Together Designs pattern of their choice, and the code will be valid until midnight (GMT) on 31st March 2012. The discount for both offers will be the same amount of £1.00. I really loved knitting both versions of this pattern and I'm looking forward to doing it again, but with slightly less pressure, as it will be "for fun" rather than as a designing exercise this time. Now all I have to do, is decide on which yarn to use!